Half term - remember that? Passed in a blink of an eye, didn't it! Just shortly before half term, I was contacted on behalf of Wyevale Garden Centres to ask if the boys and I would like to take part in one of their children's holiday activities. Of course, I said yes... anything to keep us busy during the hell wonder of school holidays! Wyevale have several garden centres across the country and they run activities during school holidays to help us parents survive without a gin drip keep our sprogs entertained. Our local centre is Cadbury nestled between Congresbury and Yatton (or outside of Bristol if you're not as yocal as us). It's always been a good place to visit with children in tow. It's large so they love to run around and get lost among the plants. Or play house in all the summer houses and sheds. They also have a Costa to keep you caffeined up and a cafe offering tasty yumminess. There's a handy little soft play too. 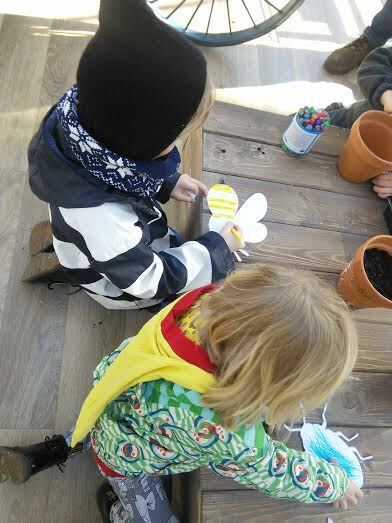 We attended a Wildlife Week session entitled "Pollination Station". Set up in the middle of the garden centre, we and a small group of children were given plant pots to decorate. There was a lovely selection of craft materials, some lovely pens including glitter gel pens (who doesn't love those? Like glitter but less messy!) and cute animal themed stickers. The boys had a lovely time sticking stickers all over their pots and getting a bit glittered up. Once the pots were decorated, they were filled with soil by one of the centres helpful staff members (they were great - very patient with my dear Felix). Once the pots were full, the children got to sprinkle on some seeds. They were also able to decorate a sweet label to be stuck into the soil. We are now waiting for our seeds to sprout and the boys are very excited about what will grow. Currently Grandma is looking after our pots. She is the green-fingered one in the family and we look forward to seeing what grows in the coming weeks! The seed mix includes flowers that insects and bees love, hence the title "Pollination Station". We've all heard how our bee population is suffering so activities like this are great. Good to give nature a little helping hand! The session lasted about 15-20 minutes and the cost was £2.50 per child to cover the costs of the materials etc. I think the length of the session was good. Especially for a child like Felix. Towards the end of 15 minutes he was itching to get away.. Ethan could probably have stayed drawing on his pot and doing some colouring for a lot longer, but he is six, not two! Bearing in mind we've come away with two sweet pots and (in time) some flowers for the bees to enjoy, I think it was good value for money. To inject a bit of real life into my review, I would like to share with you the reality of doing an activity like this with a child like Felix. The fact is that after a short period of time, he will get restless and run off... Thank goodness I am able to leave Ethan whilst I chase Felix. Felix being Felix, he managed to escape at speed. When I finally caught up with him I found him wielding a hammer in one hand and a pen knife in the other. Don't ask. After our activity we went to the cafe where he proceeded to climb onto someone else's table whilst they had gone to get some cutlery. Before I could grab him he had pinched their fruit scone and was making quite a messy dent in it. Embarrassing doesn't cut it. Let's also not forget when we visited the loos and he posted his glove into a sanitary bin. So. Much. Fun. Did we enjoy the activity? Yes. Would we do it again? Yes. Should I ever have another child? No. NO NO NO. Thank you very much Wyevale. Hope you've manged to clear up after Felix's visit!